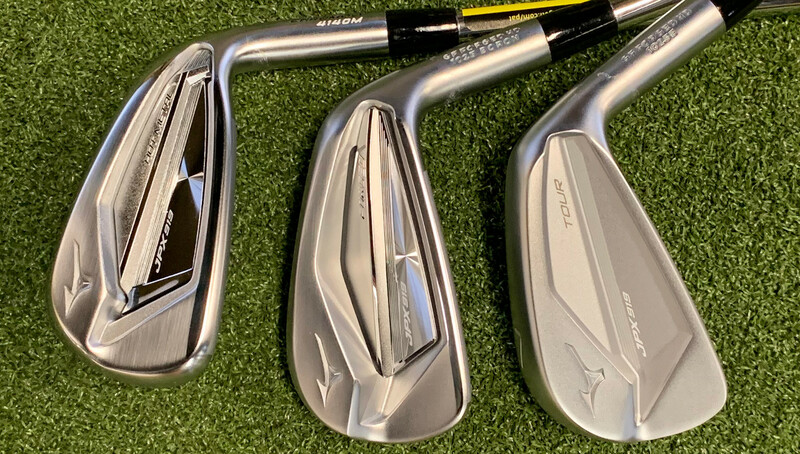 Mizuno’s JPX919 line offers three (make that four) different models with very different playing characteristics. But find the right one for your game and good things could happen on the course. The Mizuno JPX919 family debuted last fall with three members (and recently added a fourth). I compared launch monitor results from a few range sessions with 7-irons in the Hot Metal, Forged and Tour models. My findings are below, but first let’s take a look at what goes into these irons. The JPX family’s most forgiving is a good looking game improvement club. Sure it’s got a bit of a dad-body thing going—the topline and the club’s overall shape are just a tad thick—but compared to other offerings in the category, the 919 Hot Metal is a sharply dressed hunk of Chromoly. The Hot Metal gets its name from that Chromoly 4140M it is cast with. Mizuno says that Chromoly 4140M is a highly resilient material that helps it craft a multi-thickness face that improves ball speed and feel. A one piece “cupped geometry” is designed to enhance feedback, while the open heel frame is said to improve stability and launch for optimal ball flight. Mizuno tweaked the sound ribs from previous models to better produce satisfying vibration patterns at impact. The JPX919 Forged most neatly aligns with the better player distance-iron category, though its slightly oversize frame and ample cavity give it a good dose of game improvement qualities, as well. A bit of boron added to the steel that the club head is forged from increases its strength by a whopping 30%, allowing a thinner face design and other advantages. Mizuno takes advantage of that strength by using CNC milling to create a larger area of minimum face thickness. Read that “bigger sweet spot which promotes more consistent ball speed and, hence, distance.” This milling also lets Mizuno reposition weight from the club face to lower and deeper in the head (note the “pocket channel” on the back of the clubface) to enhance launch conditions in the mid and long irons. The frame of the club head is designed to provide strength, launch and distance, while also promoting the sound and feel players expect from a Mizuno club. 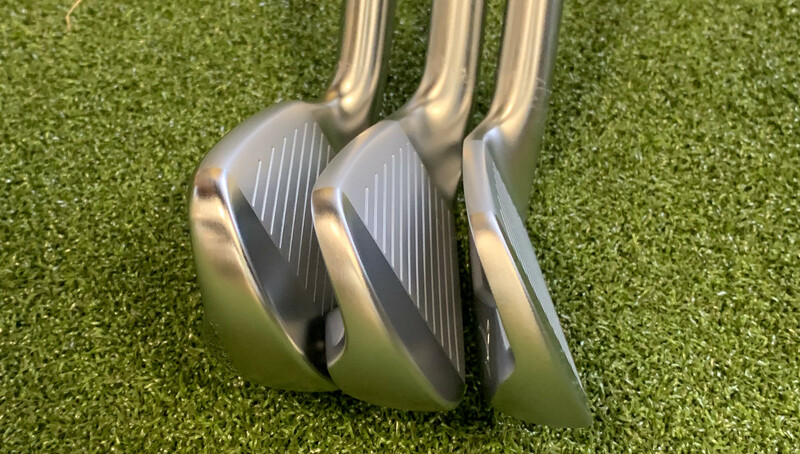 Speaking of feel, the 919 Forged are (duh) forged from 1025E mild carbon steel to produce the feel that has earned Mizuno a devoted following over the years. 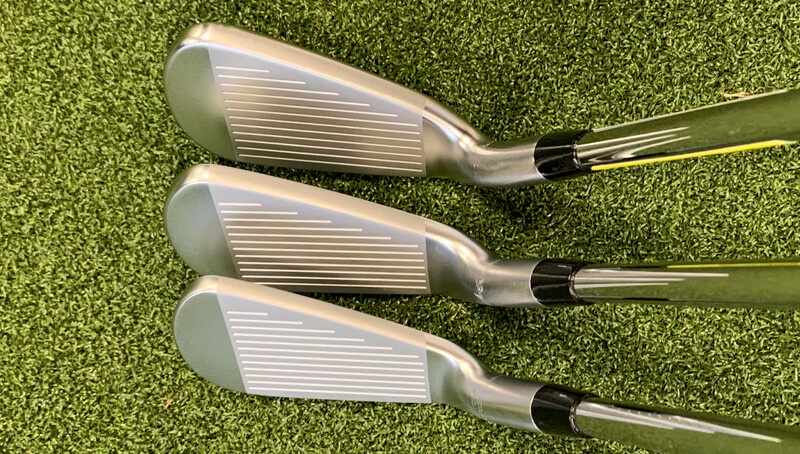 The Forged comes in a set that covers a lot of ground with lofts ranging from a 22° 4-iron to a 46° PW (not to mention a 51° GW) providing a nice compromise between distance/game improvement lofts and those of more traditional better-player irons. As you’d expect, the 919Tour is designed to be, by far, the most workable and better-player-appealing of the JPX line. In some ways it looks less forgiving than the MP-18 SC, Mizuno’s popular better-player cavity back. The top line of the club is a very bladelike 4.6mm on the 7-iron. Butter knife, anyone? The matte gray finish of the club makes it stand out from the other JPX models, but you’re not very likely to mistake it for its brethren anyway. The 919 is more compact and streamlined version of the 900 Tour. Unlike many brand, the “tour” in its name is not hyperbole. This club is being played on the PGA Tour and other major tours worldwide. Mizuno uses a process it calls “Grain Flow Forged HD (High Density) to craft the 919 Tour from a single billet of 1025E Pure Select mild carbon steel. Mizuno is known for its forgings that its devoted followers say produce some of the softest and purest feel you can get from golf clubs. Mizuno’s Stability Frame found in the other JPX models carries over to the 919 Tour, as well, providing enhanced launch to help shot achieve a loft appropriate apex for soft landing son the green. What do you want from an iron? Are you a social golfer, primarily concerned with laughs and just getting around the course in a respectable score? Or are you driven to spend a lot of time working on your swing and getting better? Maybe you’re a combination of the two. No worries. Mizuno has you covered. A couple cold weather range sessions yielded the following averages. As you can see, all of the Mizunos launched high with more than adequate distance (considering that both range sessions were in 30° weather). 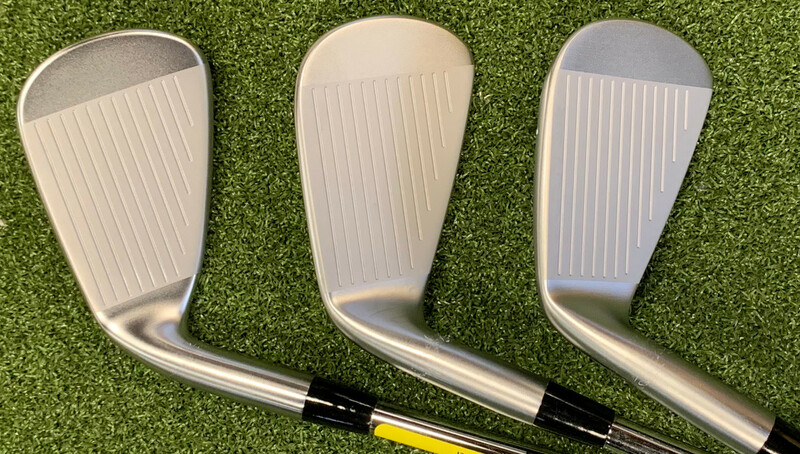 The loft of each model is 2° weaker in each model from left to right below, so you are looking at effectively a club’s difference in both loft and the corresponding distance. Spin was noticeably lower in the Hot Metal. Boom! The Hot Metal is just plain fun to hit. There’s no harsh feel on less than stellar contact, and the ball still explodes off the clubface when you pure it. Surprisingly soft feeling for a cast club, the Hot Metal offers less feedback than its forged brothers, but you can still tell heel from toe hits. Anything in the vicinity of center contact tends to feel pretty similar. Since this club is aimed at mid-cappers and higher, that’s going to be just fine since at that level just making contact is more important than making perfect contact. We’re aiming at advancing the ball and getting it somewhere on, or at least near, the green, at this point. The Hot Metal is a distance machine. I felt like I could almost swing as hard as I wanted to with impunity. As long as club face met ball, the Hot Metal generated ample distance and good direction. I generated a 12-yard vertical dispersion on good swings. That’s a lot, but compared to some clubs I’ve hit that seem to have extreme “hotspots” on the face, 12 yards is playable. If you shoot for the center of greens, plus or minus 14 yards is still going to have you putting most of the time. This club is going to do good things for lots of golfers who just want to get out and play rather than spending time working on their game. Rather than Game Improvement, we should call this sector Game Enjoyment. The Hot Metal will be just fine with you pulling them out of the garage once a week or once a month for a round. Within reason, they aren’t going to punish you too much for not spending time with them. For a company known for its Forged offerings, the 919 Hot Metal is a very strong contender in the game improvement/distance category. Your relationship with the JPX919 Forged is going to be a little more time consuming but only a little. 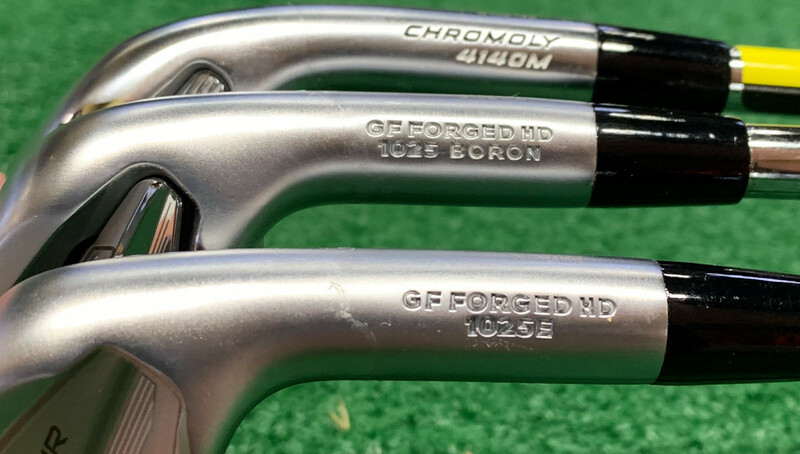 The Forged is a better fit for players who are going to visit the range, at least on occasion. There’s a fair bit of forgiveness here, but you won’t want contact to stray too far from the center of the club face. When it comes to distance, the Forged is a little more than a half club shorter than the Hot Metal, but it also has about a half club higher loft so that’s to be expected. I found that the Forged likes to send the ball way up compared to its brethren (which are not low launching by any means). That’s going to be great for mid-cappers who may struggle to hold greens, but those who play frequently in the wind may want to take note. Comparing distances with the other 919s is not a fair fight for the Tour. The Tour 7-iron loft is 34° 32° in the Forged, and 30° in the Hot Metal. So if when you’re comparing the Tour’s distance to the Hot Metal, you are essentially comparing a 7-iron to a 6-iron (that just happens to be stamped with a “7”). The yardages I got bore that out. The Tour was around a club and a half shorter than the Hot Metal and almost a full club shorter than the Forged. The Tour requires a good bit more precision than its two stablemates. You don’t have to be Brooks Koepka, but it wouldn’t hurt. A friend of mine who runs a golf shop likes to say, “Forget about that ‘JPX’ on the club, the Tour is an ‘MP’ in disguise” (referencing Mizuno’s better player line). The Tour wants to be hit pretty close to center all the time. On the launch monitor, I experienced a noticeable drop in smash factor compared to the other two models, which attests both to the precision that the Tour demands and my less-than-precise early season swing. But if your swing is up to its demands, the Tour really delivers. My best swings resulted in beautiful ball flights, a great sensation of compressing the ball and ample spin to stop the ball on the green. I would love to play this club all the time, but it’s probably not the best choice for me. While there’s enough forgiveness in the Tour to help you get around the course, you will need to make consistently good contact to truly score well (that or you better chip really well). The Tour is a demanding club, but if you have good ball striking and reasonable swing speed it could become your new best friend. Late to the party is the Hot Metal Pro, arriving with less offset and a lot of promise. This club could be a great solution for a wide range of golfers. Presumably, it will be as long and forgiving as the regular Hot Metal while providing a bit more shot shaping ability and will just look better for players who don’t like the look of an offset club at address. Kudos to Mizuno for offering a game improvement iron that should still appear to better players looking for more forgiveness and distance. Mizuno has definitely upped its game with the 919 family of irons. There’s something here for nearly every golfer out there. High handicappers are going to get a lot of help from the Hot Metal. Solid ball strikers are going to find the workability and consistent ball flight and distance in the Tour. And those of us in between will find the Forged to be a good friend on the course.